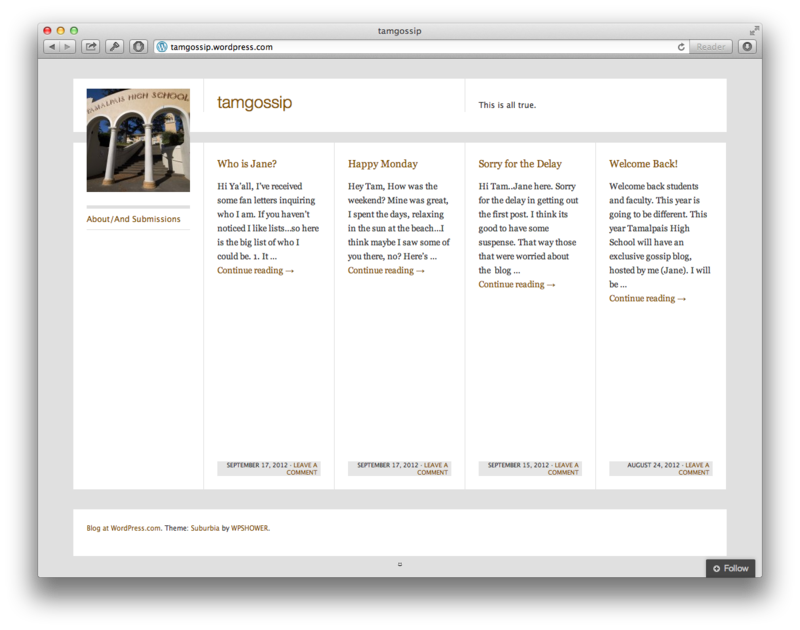 A new blog struck a nerve this month with posts of gossip about Tam students. This type of blog is detrimental to the accepting atmosphere that Tam promotes, and harms student reputations with potentially illegal misinformation. Posting untruths online can have a very real consequence. It’s called libel. If any of the false “gossip” on the blog damages someone’s reputation, that person can file a lawsuit against whoever is behind the posts. The site’s author(s) won’t necessarily stay anonymous forever. The blog has caught students’ attention by circulating through Facebook and word of mouth. The reaction from the senior class, as seen on the “Tam High Class of 2013” Facebook group, has been decidedly negative—and rightly so. Most students recognize Tam as a place where students can feel safe. Tam has a relaxed atmosphere where, for the most part, students don’t have to worry about stereotypical high school cliques and gossip. Tam is much better than an average high school, and the laid-back attitude of its students is part of why it’s so great. This unique culture is easily spoiled by gossip which may seem harmless, but in reality is very damaging. The Tam News takes what we publish about others very seriously, and we hope other student-run forums do the same. Gossip springs from insecurities of those spreading the gossip. It separates the student body and weakens relationships, and by paying attention to it you amplify the insecurities of the Tam community—including your own. Do your part as a Tam student by ignoring gossip, so the blog fades away as an example of behavior that students find unacceptable. As of now the site has been taken down. We hope it stays that way.